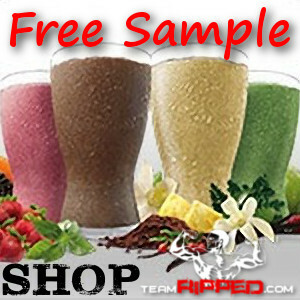 For teamRIPPED Members in the US and Canada only! See the FAQ for more. Shakeology has been one of the biggest keys to my awesome results. It’s the cornerstone of my daily nutrition, and I’ve been drinking it daily for over 3 years now. I’m such a believer in it that I will send you a Shakeology sample on my own dime if you’d like to try it. One Shakeology sample won’t transform your life, but if you are considering Shakeology and are hesitant to buy it before you taste it, that’s what this sample offer is for. If you aren’t serious about ordering Shakeology, please don’t ask me for a sample because it costs me over $5 of my own money to send each Shakeology sample out. If you are serious about your nutrition and your results, I’m more than happy to let you see what Shakeology is all about, at my own expense, because once you try it for yourself you’ll understand why so many people rave about it … and your results will go through the roof! I love being able to invest in you, as you invest in your own health! 1) You haven’t tried Shakeology before and are serious about ordering Shakeology if you like the taste. 2) You must be a member of teamRIPPED. If you haven’t made me your coach yet, that’s easy … AND FREE! You can join teamRIPPED by CLICKING HERE . Then just follow the insructions to fill out the form for a free teambeachbody account. ***NOTE*** If you already have a teambeachbody account, clicking that link above will not make you a member of teamRIPPED. It will simply redirect you to your existing teambeachbody account. You can still join our team, but you’ll need to email me at coachwayne@teamripped.com for details. Simply fill out the form below! Make sure you pick which flavor you’d like to try! Thanks for being a member of teamRIPPED!